CANBERRA, Australia, June 24, 2010 (ENS) – Australia has a renewed opportunity to fight climate change, this time under the country’s first woman prime minister. Kevin Rudd stepped aside as prime minister today, opening the path for Deputy Prime Minister Julia Gillard, 48, a Welsh-born former trial lawyer, to take the top post in the governing Labor Party. Gillard now has just a few months to put the goverment back on track before an election must be called. Gillard has distanced herself from Rudd’s delay of a planned carbon emissions reduction scheme that cost the Labor government public support. In May Labor’s primary vote fell eight points from 43 percent to 35 percent after the government announced it would shelve the emissions trading scheme. Greenpeace Australia warned that Gillard’s actions on climate change will be important in the run-up to the election in this coal-mining, fossil-fuel dependent country. 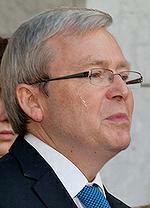 “Failure to act on climate change claimed the political scalp of Kevin Rudd and John Howard before him. How Julia Gillard responds to the issue will play a crucial role in the success of her leadership,” said Greenpeace Australia’s John Hepburn. But Hepburn said the new prime minister’s first words on climate change were not revealing. “I believe in climate change,” she said, followed by a statement of belief that humans are contributing to the problem, and that she would seek consensus towards a price on carbon as global economic conditions improve. 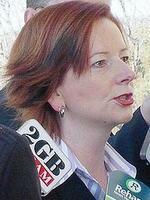 The country’s largest environmental group welcomed Gillard as Australia’s new leader. “I congratulate Ms. Gillard and urge her to lead an Australian shift from a pollution dependent economy to a clean economy and a healthy environment,” said Australian Conservation Foundation CEO Don Henry. Exit polls from the 2007 election showed climate change was among the top two issues for voters in the election that saw John Howard lose the prime ministership. “We urge Prime Minister Gillard to put a price on pollution and to boost support for renewable energy and energy efficiency initiatives,” Henry said. “Much more also needs to be done to protect special places like our marine environments, the Murray-Darling Basin, our forests and the superb natural and cultural values of northern Australia,” said Henry. Henry had praise for Rudd, who will run in the upcoming election to represent his Brisbane constituency in Parliament. “ACF warmly acknowledges Kevin Rudd’s strong leadership role before and during the difficult Copenhagen climate talks last year, the achievement of a 20 percent renewable energy target and his first act as Prime Minister, ratifying the Kyoto Protocol,” Henry said. Gillard has expressed her support for the Carbon Pollution Reduction Scheme, but said last September that its success would need a broad-based public recognition of the need to combat climate change. “We will only create a greener economy and begin to meet the climate change challenge if there is a widespread movement for change,” Gillard said at the launch of ClimateWorks Australia, a new nonprofit organization that aims to create a prosperous low carbon society. But today, the Labor government is under criticism from The Wilderness Society for considering financial incentives for the logging of native forests to generate biomass energy. The practice wipes out the carbon sink that the growing forest provided and puts carbon dioxide into the atmosphere when the wood is burned. Today’s Senate debate on the detail of the Renewable Energy Target legislation will lead to new laws that incentivize logging, woodchipping, and burning native forests for power; a practice called ‘biomass burners’ or ‘forest furnaces,’ warned the advocacy group. “The climate takes a big hit when forests are burnt for power, generating carbon emissions that cannot be removed from the atmosphere for hundreds of years,” said Virginia Young, The Wilderness Society’s strategic campaigns director. “Yet today the government has disgracefully allowed for forest furnaces to get incentives that are meant for genuinely environmentally friendly technologies to create power,” she said. 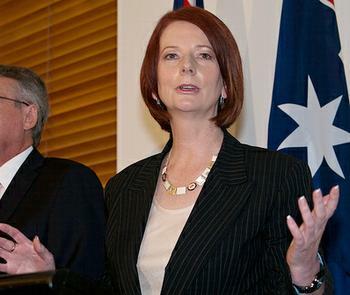 Senator Bob Brown, Leader of the Australian Greens, congratulated Gillard as the newly elected leader of the Australian Labor Party and the first woman to become Australia’s Prime Minister. Senator Brown said he looks forward to a positive and constructive working relationship with Gillard.